You cannot make the wrong choice with this ultra glamorous Rachel Allan two-piece 4537. 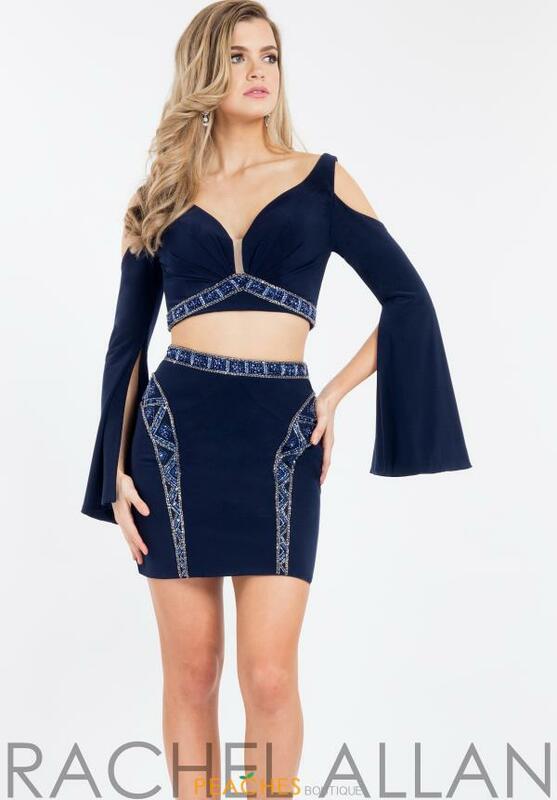 The jersey crop top hugs your bodice as a deep V-cut neckline pairs elegantly with the cold shoulder and long dramatic sleeves with a slit for flow. A sheer inset is inserted along the neckline as a beaded midriff gives you some sparkle. The fitted skirt showcases a beaded waistline belt with beaded sides, giving a stunning illusion. The low V-cut back is the perfect finishing detail for your ensemble. Peaches Boutique in Chicago houses over 20,000 dress, so you are sure to find the one.